Create a stylish and dramatic look in your bird garden by adding the Woodlink Coppertop Hanging Wren House to it. The significant, pitched roof, cedar body, and bird detailing add a bold look to your backyard, certain to capture the attention of your favorite songbirds. A 1.125" diameter entry rests in the center of the front panel, offering small birds access to the roost, and the roof overhangs the entry to help the nest remain dry. Gaps on each side of the shelter, as well as one at the top of the front panel, provide ventilation, and the flat base allows a small bird to nest easily. One side panel opens for seasonal cleanings or nest checks, and the lasting cedar construction ensures a natural and hardy abode. Hang this home from a hook or branch using its attached cable, for you and your birds to enjoy for several seasons. 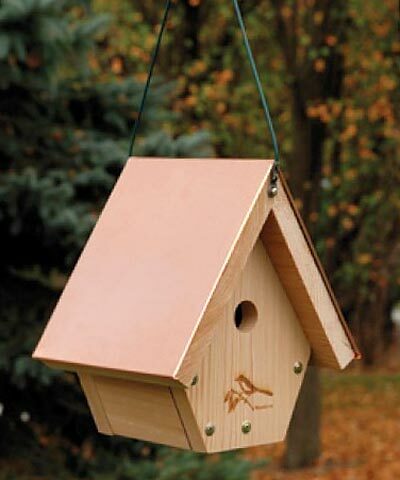 Place a remarkable roost in your backyard with this Coppertop Hanging Wren House. Made in the USA.